Dragons are beautiful, wise, open-hearted etheric beings of the angelic realms who are sent here by Source to help and assist us. They operate on a different vibrational frequency to us, which is why most people can't see them, but they are very willing to connect with us if we are ready to tune in to their wavelength. Dragons really love the planet and everyone on it, and are pouring into Earth now to help us with the transition to the new Golden Age. They can protect and care for you, be your friend and companion, and help in a myriad of ways. The help they can offer depends on the type of dragon they are. As you work with these Dragon oracle you will discover many ways in which dragons can support your life, assist your spiritual growth and illuminate your ascension path. 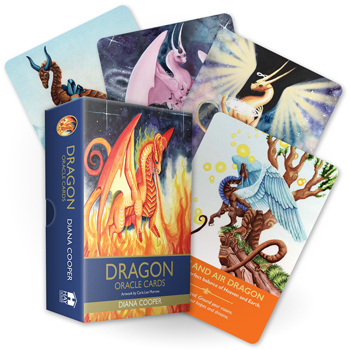 These Dragon Oracle Cards Deck will attune you to the different dragons. They will also offer you guidance about your daily life, your soul mission, your ascension path, and how you can serve the planet.